Awami League on Sunday said interviewing nomination seekers by BNP acting chairman Tarique Rahman through a teleconference is clear violation of the electoral laws and the directives of the ‘Supreme Court’. An AL delegation, led by Col (retd) Muhammad Faruk Khan, MP, handed over a written complaint in this regard to EC Secretary Helaluddin Ahmed at his Nirbachan Bhaban office in the evening. 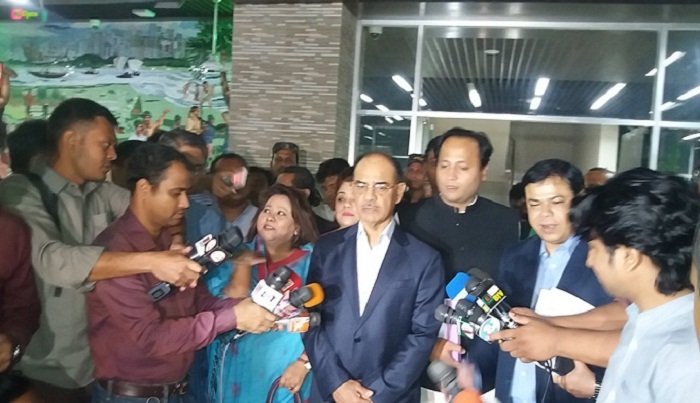 “The people of the country saw and we also listened to and watched that Tarique Rahman, a fugitive convict, interviewed his party nomination seekers through skype or teleconference or any other means, which is a clear violation of the electoral rules and the directives of our highest court,” Faruk Khan told reporters after lodging the complaint. Earlier, he said, the ‘Supreme Court’ issued the directives that no speech of Tarique Rahman can be published anywhere. He said they asked the EC to take immediate measures to stop the violation of such electoral rules. “The EC has told us that it’ll take measures examining their complaints,” said Faruk Khan. Clarifying the complaint of violation of the electoral code, AL organising secretary Barrister Mohibul Hasan Chowdhury Nowfel said the court order is considered as traditional laws of the country and the electoral code suggests following all the traditional laws. “So, defying the court order, they in fact breached the polls code,” he said. Nowfel said Tarique interviewed nomination seekers through teleconference which also came in the media. Noting that right now Tarique Rahman is a fugitive and convicted person, the AL leader said Tarique Rahman cannot join any political and electoral process. He said there is an order of the highest court that his live streaming and broadcasting conference cannot be published or aired. “Taking any interview by a fugitive and convicted person is not only illegal, but also unethical,” Nowfel said. He urged the media to follow the court order refraining from publishing the matter of a fugitive convicted person. Faruk Khan said Tarique Rahman cannot be the acting chairman of BNP by changing the party charter. He also alleged that Oikyafront, BNP and Jamaat joined the election campaign on the premises of the Supreme Court throughout the last two days. “The remarks which were made there are clear violation of electoral laws,” said the AL leader. He hoped that the Election Commission will take necessary measures in this regard soon. Replying to a question, Faruk Khan said the release of ‘Hasina, A Daughter’s Tale’, a 70-minute docudrama on the eldest child of Father of the Nation Bangabandhu Sheikh Mujibur Rahman has no link with election campaign.